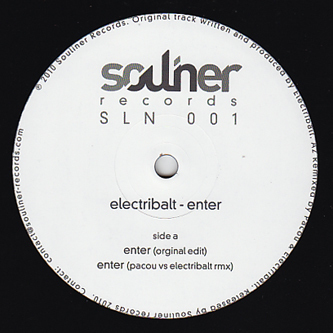 Solid and diverse set of techno trax from Electribalt with Pacou and Pablo Bolivar remixes. To date Electribalt productions have been a preserve of the digital realm, with releases on digi labes Silent Season and Enypnion but 'Enter' is a fine intorduction 'pon wax with a heavyweight tech-house rhythm driven by bulky bass and simmering filter vibes. Against Pacou they ratchet up the tempo for a proper pounder, while Pacou pulls off a Surgeon-esque mix on the flip and Bolivar provides a tidily minimal version.